The media has been obsessing over the idea that anarchists might wreak havoc (read: break some windows) on May Day. Conversely, I have yet to see substantial reporting of the actual demands being made by the vast majority of people who took to the streets today. Puget Sound Business Journal was typical, noting that a colorful, family-friendly immigrant and workers' rights march took place only as background for the more important point: "no shattered glass." "I think it's a huge shame," Rahwa Habte, an organizer with the immigrant rights group One America, told me as the march descended down King Street in the International District. "[The property damage] happened for a short amount of time and was pretty contained, but it cast a huge cloud over all of May Day last year. And that cloud has now extended into this year." In 2012, the downtown smashup happened early in the day and attracted a lot of police attention, deterring a lot of immigrants from marching, Habte said. But not this year. The afternoon march began at Judkins Park and wove its way downtown, taking up two to three city blocks and probably about 2,000 strong. Make no mistake: Anarchists have no monopoly on passionate calls for transformative change. Judging by the signs, banners, and chants, key demands include an immediate halt to deportations and family separations, and a legalization process for the 12 million undocumented people who've emigrated here. 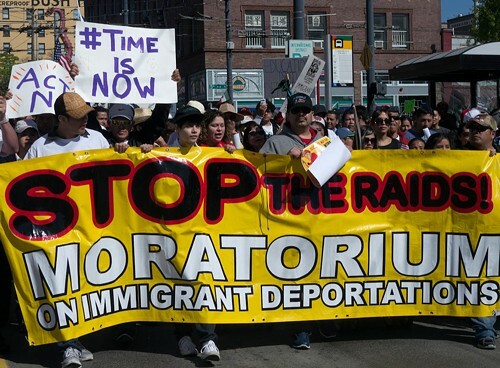 These demands date back to the historic marches for comprehensive immigration reform that swept across the country in 2006—some of the largest demonstrations ever, in many cities. In Seattle, about 5,000 people were expected that year. At least 15,000 people turned out. "This seems like it is the year for comprehensive immigration reform to happen," Habte explained. "So this is a glimmer of hope for the folks that I work with and know, who are being impacted right now by our broken immigration system. Not only the faster it happens, but the better the bill is, it's really going to make a huge difference in people's lives and communities." Of course, May Day is also known as International Workers Day, dating back to 1886 when labor activists went on strike for the eight-hour work day and a group of anarchists were hanged. At the march today, I was impressed by the sheer variety of groups present, many of them holding their own banners. Among them were Seattle Solidarity Network and Standing Against Foreclosure and Eviction (SAFE), which grew out of Occupy Seattle. Both groups are anarchism-inspired and work to empower ordinary people against those higher up in the class hierarchy—bosses, landlords, and banks. These are the types of anarchists doing community organizing, week in and week out, based on the values of mutual aid and solidarity. Local reporters who make the tired and intellectually lazy joke that "anarchists organizing themselves is an oxymoron, ha!" really should just STFU. Among the many other groups represented at the march today: Physicians for a National Health Program, SEIU, Teamsters, Native Americans, Anakbayan Seattle, Latino Liberation Movement, Local 1789 AFT Seattle from community colleges, Who You Callin' Illegal? and of course, El Comite. Anarchists-versus-police should be far from the main story here. The message from the big march today was that America ought to be a lot more fair to immigrants and workers. Let's not lose sight of that.